Jack Bell Gallery is pleased to present a series of paintings and sculptures by contemporary artist Boris Nzebo. In this new body of work he continues to explore subjects drawn from his hometown Douala, Cameroon’s largest city, as well as the Central African region. This will be the artist’s sixth solo exhibition with the gallery. Nzebo constructs portraits using detailed studies of traditional African hairstyles, layered with informal snapshots of local neighbourhoods, urban architecture and scenes from daily life. Recent paintings address current affaires and tackle violence, social inequalities and political instability. 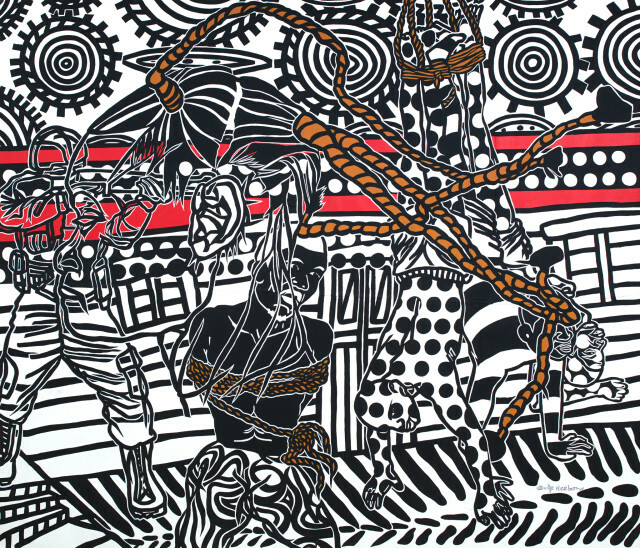 Nzebo's stylized execution owes a lot to painted haircut signs found outside Cameroon's barber shops, as well as the murals and graffiti throughout Douala’s suburbs. He uses a strong colour palette and appropriates the language of advertising.